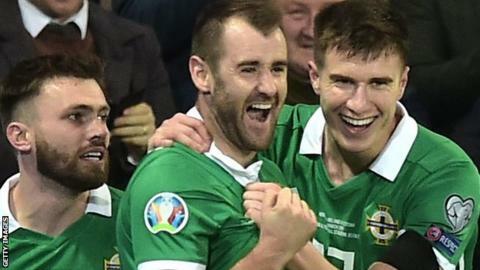 Scotland have an "unbelievable" squad of players but may be suffering from a lack of confidence, says Northern Ireland's Niall McGinn. The Aberdeen winger has relished working under Michael O'Neill, who led the side to the European Championship last 16 three years ago. Scotland have not reached a major tournament finals since 1998. "When you come away with Northern Ireland, you put your club stuff aside," McGinn said. "Whether you're playing week in, week out or not, you come away, new faces, good confidence, good camaraderie, and that translates to performances and results." Alex McLeish's Scots endured a disappointing start to their Euro 2020 qualifying campaign, losing 3-0 in Kazakhstan and only mustering a 2-0 away win over San Marino, the world's lowest-ranked team. "The squad of players [Scotland] can choose from is probably unbelievable," McGinn added. "Players playing at a high level, great quality, it's just maybe getting that consistency and breeding that confidence throughout the squad." O'Neill, not McLeish, was the Scottish FA's preferred candidate to replace Gordon Strachan when he left the manager's role in October 2017. But three months later, the former Brechin City boss opted to remain in the post he has held for over seven years. "Michael's man-management skills have been second to none and that's brought in a fresh air among the squad and that's absolutely continued over the last five-six seasons," said McGinn, who helped Northern Ireland begin their qualifying campaign with victories over Estonia and Belarus, scoring in the former. "He leaves no stone unturned, he does a lot of work behind the scenes, keeps an eye on his players constantly. He's always on the go, always trying to improve things, and that's definitely shown with how we've done over the last number of years. "We're a team with no Maradonas, everyone shows up, gives 100%, and we've got a great manager who has built up a great relationship with the players."